Questions about Alzheimer's for Your Oakland Senior Love One? Read on for Answers! To bolster their efforts, we’ve answered five frequently asked questions about Alzheimer’s below. Read on to learn vital information to help an Oakland senior loved one dealing with Alzheimer’s. To learn even more, be sure to follow our blog and Facebook page in November as we’ll be sharing real life stories of families with Alzheimer’s and dementia as well as ideas to help care for a loved one with these diseases. More research is necessary to thoroughly understand the causes of Alzheimer’s. However, it’s generally accepted that the late-onset form of the disease (by far the most prevalent) develops slowly over decades based on a variety of genetic, environmental, and lifestyle factors. Having a close relative with the disease increases a person’s risk, but is by no means a guarantee. As for environmental and lifestyle variables, increasing age is the most significant risk factor, but high blood pressure and diabetes can also play a role. Alzheimer’s is most commonly characterized by mental confusion and forgetfulness, but these symptoms also accompany normal aging. What’s the difference? The Alzheimer’s Association lists ten typical signs of Alzheimer’s, including memory loss that disrupts daily life, challenges in planning or solving problems, and difficulty completing familiar tasks. They also differentiate these symptoms from the milder signs of normal cognitive decline. For instance, while a normal older adult might occasionally struggle to balance their checkbook or forget an important name or date and then remember it later, these difficulties are more persistent for an Oakland senior Alzheimer’s sufferer. How can I prevent Alzheimer’s as an Oakland Senior? BrightStar Home Care of Oakland proudly provides Home Care and Support for seniors living in, but not limited to, Oakland, Berkeley and Pinole. Our services include 24-hour in home care, and support in independent and assisted senior living communities. We provide all levels of home care from companion services to Skilled Nursing. 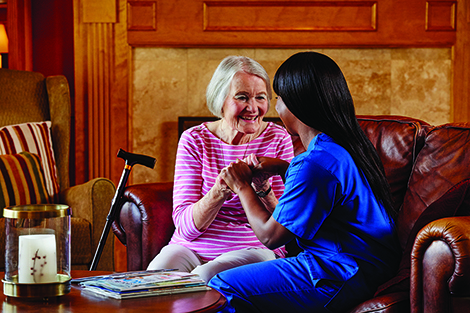 Our highly skilled caregivers and nurses provide Medical Staffing, Senior Home Care, In-Home Skilled Nursing, In-Home Physical Therapy for pediatric, adult and senior patients as well as Companion and Personal Care for Hospice care, Live-in care, CNA, Caregiver, RN, LPN, RN Supervision, Compassionate Care, and Compatibility Guarantees. We train all of our caregivers in care for memory loss patients and seniors with dementia. We are proud to be an ALS Society partner and Alzheimer Association member, and have been providing care for developmentally disabled and individuals with mental health and behavioral health diagnosis for years. We also offer services to individuals who are not necessarily seniors. These include safe discharge and transportation from the hospital or rehab facility, Post Operation care for both short and long term, Pre Operation and preparation help and assistance, client monitoring for out of town family members. Our service area covers Alameda County including Oakland, Berkeley, Kensington, Alameda, Piedmont, Montclair, Albany, Richmond, San Pablo, Hercules, Pinole, Rodeo Crockett.